Jaya Sri Sri Radha Shyamasundar! All glories to our Merciful Guru & Saviour, His Divine Grace A.C. Bhaktivedanta Swami Prabhupada! This site is dedicated to our guru Srila Prabhupada and our deities, Sri Sri Radha Shyamasundar located in Vaughan (Toronto) Canada. 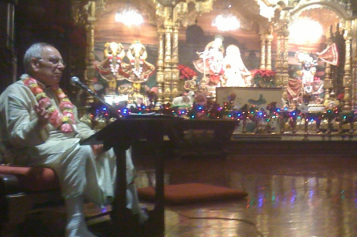 With Srila Prabhupada's mercy it has been 40 years since we became Krishna Conscious and as we get older we want to take this opportunity to glorify Srila Prabhupada, continue to serve Srila Prabhupada and provide some insights, reflections, memories and history that can be shared by our children, grandchildren, future generations as well as Godbrothers/Sisters, devotees and well-wishers. This is our humble attempt to glorify Srila Prabhupada, since it is with his mercy we have been able to worship Sri Radha Krishna. He gave us our first love, Sri Sri Radha Ksira Chor Gopinatha in ISKCON Toronto, then our second love Sri Sri Kishore Kishori in ISKCON Chicago and then our home deities Sri Sri Radha Shyamasundar. 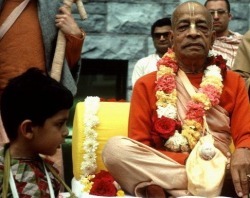 The site has a variety of memories from the time we spent with Srila Prabhupada in Canada, America and India as well his two visits to our home in 1975 and 1976. We were also fortunate to get some letters from Srila Prabhupada and we have included these as well as excerpts of published conversations from our home. 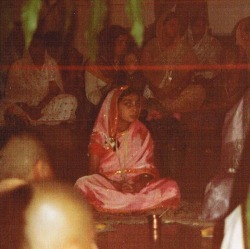 We have also included some vintage pictures from service we rendered to the yatras in ISKCON Toronto and Chicago. 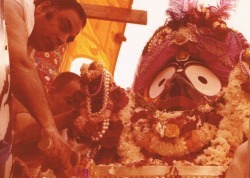 It has been over 40 years since we joined ISKCON. We saw devotees chanting on the street in Toronto and were immediately attracted. We started coming to the temple, which at that time in the late 60's was in a small house. We hankered to meet Srila Prabhupada and decided to drive to Chicago to meet him. That visit sealed the deal and in the 70's we had the privilege to have darshan with Srila Prabhupada many times in North America and India, including his visits to our home in 1975 and 1976. Srila Prabhupada instructed Visvakarma and myself to secure the current ISKCON Toronto temple and I had the great fortune to be an instrument in the hands of Srila Prabhupada and Sri Sri Radha Gopinatha to assist Srila Prabhupada's mission in this manner. With Srila Prabhupada's mercy, he used me as his instrument again to help secure the ISKCON Chicago temple on Lunt where Sri Kishor Kishori reside today. There were many temple openings and festivals that I was blessed to coordinate and be a part of in the early days of ISKCON and for this I will always be grateful to my Guru Maharaj. At the time many Indian bodied people in North America questioned Srila Prabhupada and ISKCON and few were willing to join. However, after meeting so many "sadhus" and then meeting Srila Prabhupada for the first time in Chicago, I knew he was the one and it was straight to dandavats to my guru and saviour. Also, during my service to ISKCON I have always dipped into our savings or held outside income sources to support my family and have donated funds to Srila Prabhupada's mission. at which time I decided to retire from ISKCON political life to spend more time on Krishna bhakti as opposed to management/politics as well as fulfill my grahasta duties and focus on Srila Prabhupada's personal instructions to me. My parents are not technically savvy and have asked for for my assistance in putting together this site. I do this with pleasure and as a service to them. I was born into ISKCON and have had the fortune to meet Srila Prabhupada which is the seed for my bhakti. My parents have nurtured that seed and it is because of their example and dedication that I have continued to chant and worship since I was 4 years old. I have seen their unwavering faith in Srila Prabhupada through thick and thin in ISKCON including the difficult period after Srila Prabhupada's physical departure and into the 80's. I have seen them continuously do their rounds, maintain deity worship and overall sadhana while also fulfilling their grahasta duties towards me and my sister and now our children and extended family. I also witnessed my dad serve with vigor when he was younger and making personal and financial sacrifices to serve the movement including leaving his job and uprooting the family to serve Srila Prabhupada's ISKCON. 40 years later my dad has difficulty walking and standing for extended period of times and many forget what early devotees had to go trough when "Hare Krishna's" were not readily accepted, only a few Indians stepped up to the plate to actually assist Srila Prabhupada in his movement, and devotees attending the daily morning program and doing daily service in the temple was the norm. We did our gurukula stints, my sis in Dallas and me in New Vrindavan. In Chicago they sent us to a school right across from the temple, which made for interesting school yard "discussions". Overall, they provided us a good education and basis for success in the material world while grounding us in Gaudiya-Vaishnvaism. They are now busy instilling the same values into their seven grandchildren and hopefully raising a 3rd generation of devotees. I hope to follow their footsteps in the grahasta ashram. We stay away from the management of ISKCON and rather focus on the nectar Srila Prabhupada has provided. In Vrindavan I fell asleep in Srila Prabhupada's lap and he did not let my parents take me from his room telling them that I was his grandson, and Srila Prabhupada, holding my hand, personally brought me to them once I woke up. In a letter to Minakshi, Srila Prabhupada wrote "I am always thinking of you and your brother, what nice devotees you are" and I am trying to live up to that standard by following in the footsteps of my parents including doing deity worship to Sri Sri Radha Shyamasundar. I am glad I can be of service to my parents as they share their recollections. I have aged and my hair is now grey and my stamina is not what it used to be but I am glad that I am still trying to be Srila Prabhupada's insignificant servant. He has blessed me with the ability to wake up every morning and serve Sri Radha Shyamasundar. Both of our kids were raised in ISKCON and they both met Srila Prabhupada. They became attached to Srila Prabhupada and grew up Krishna Conscious and thier children (my grandchildren) are now chanting and will hopefully represent the 3rd generation of ISKCON devotees. In reflection, I had to witness many godbrothers face difficulty as the years passed and I realized that it is crucial that sadhana needs to be maintained first and foremost. In addition, the taking responsibility for the famiy's needs, both materially and spirtually allows us to set an example of grahasta life and its importance within a thriving ISKCON. Too often responsabilities and children were neglected which does not make sense, since this is not what Srila Prabhupada wanted and we also need to cultivate future generations to carry on Srila Prabhupada's mission. With that said, every Prabhupada disciple, grand-disciple and ISKCON well-wisher should be happy that Srila Prabhupada's movement in being carried forward and expanding with increases in temples, centers, devotees and book distribution. Srila Prabhupada emphasized the "Purity is the Force" and if we all do our part in carrying out his mission and coperating with each other as he desired, Chaitanya Mahaprabhu's message that Srila Prabhupada has so eloquently delivered will reach the masses. I am just happy to be a servant in His movement and like when Sri Ram built the bridge there were many heavy lifters, I realize that I am just like an ant moving a pebble but happy to be of service to Guru & Gauranga.